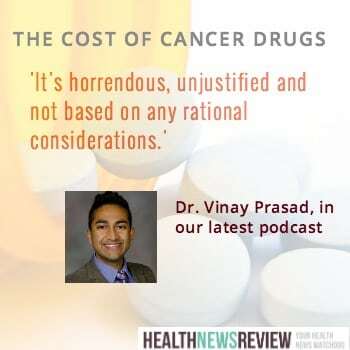 It doesn’t take much to get Vinay Prasad, MD, started. Throw out a few ideas…. Over promotion of surrogate endpoints. Over promotion of screening tests. News coverage of medical journals. ….and you’re off to the races. He’s only 33 but he has already earned respect as a hematologist-oncologist now at the Oregon Health and Sciences University with appointments in the Division of Public Health and Preventive Medicine, and as a Senior Scholar in the Center for Health Care Ethics. On Precision and Genomic Medicine: Genetics-based medicine a matter of debate Bend Bulletin. Study raises questions FDA standards on new cancer drugs. Milwaukee Journal Sentinel. Why cancer screening has never been shown to “save lives” – It is Misleading to Say Cancer Screening Saves Lives. Newsweek. Media Coverage of Medical Journals: Does the Media Select the best stories? Medical News: Evidence Not a Factor – Medpage Today. Many other articles about his work. Many of his journal articles. Thanks to The National Institute for Health Care Management Foundation for providing us with a grant to produce these podcasts. All episodes of our podcasts are archived on this page on HealthNewsReview.org. In-depth discussion on health care and news media messaging.